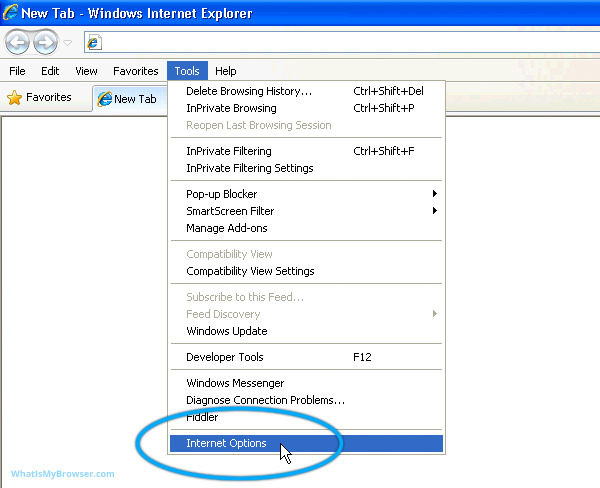 This guide will step you through the process of enabling Cookies in Internet Explorer. 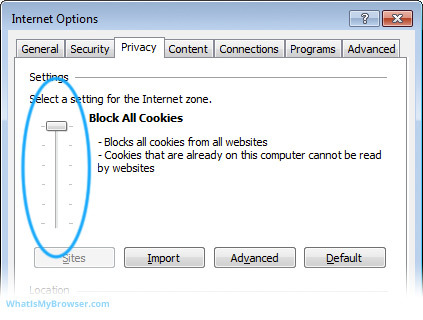 There is more than one setting in Internet Explorer which can block or disable cookies and cause some issues with websites. In the default settings for Privacy and Cookies, there is a slider control at the top of the Privacy window which can be dragged up or down to select varying levels of Cookie security. If you see this sliding bar on the left, you can drag it up and down and note the description on the right-hand side change to describe the level of security provided. It ranges from Block All Cookies to Accept All Cookies. The default setting is Medium, which provides a balance of being permissive enough with Cookies to have a good experience on the internet while still blocking certain types of Cookies which could leak private information about you. 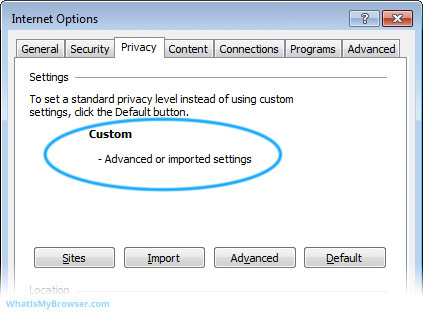 If you see the following message: "Custom - Advanced or imported settings" (shown in the next screenshot), it means that custom settings have been used instead of just dragging to select a custom privacy level. 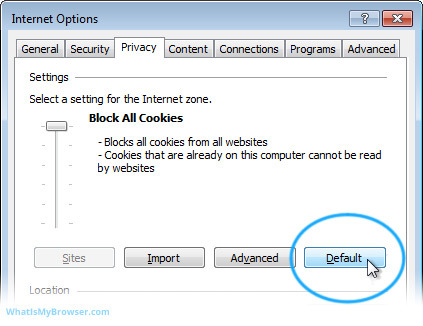 Generally speaking, if you're having problems using websites because your Cookie settings have been changed, the easiest way to fix this is simply by resetting to Internet Explorer's default Privacy/Cookies setting. This addresses the situation whether you've dragged your Privacy Settings slider up or down, or clicked Advanced and created your own custom settings. This is the easiest way to get them back to baseline. This is done by clicking the button marked Default. 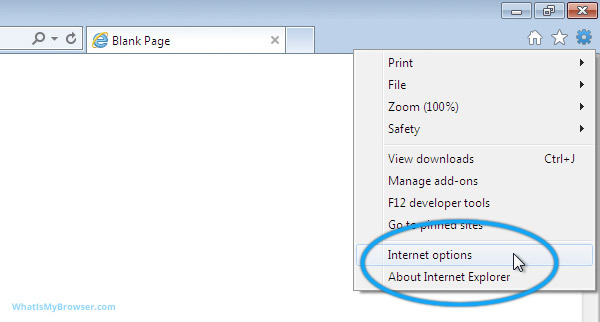 Of course, don't forget to press the OK button at the bottom of the window to accept the settings change. This should fix most or all of your Cookies problems. If you need or want to exercise fine grained control over your cookies policy - for example allowing or blocking Third Party Cookies - click the Advanced button and override the automatic cookie handling by choosing your own settings. Congratulations, you just configured Cookies in Internet Explorer. Click here to check if Cookies are enabled.